In a large bowl, use your fingers or a whisk to crumble the prepared cake. Then combine it with the frosting until evenly mixed. Freeze the mixture for 10-15 minutes, or until chilled. Grease a small aluminum can (I used a tomato paste can) with butter or cooking spray. Then carefully press some of the chilled cake pop mix into the can or mold, and then squeeze the can and pound on the bottom of the can until the molded cake pop comes out. Repeat 4-5 more times with additional cake pops, then freeze until the edges are firm and chilled. Meanwhile, in a microwave or double boiler, heat the white chocolate or almond bark until melted, stirring occasionally. Spoon some of the chocolate onto one of the ends of a chilled cob, and then place the yellow holder in the end. Repeat on the other side. Lay the cob on its side, then spoon a small strip of chocolate along the length of the cob. Quickly press the jelly beans into the chocolate in a single-file row before the chocolate hardens. Repeat with more chocolate, jelly beans, chocolate, jelly beans, etc. until the cob is covered. Surprise your friends with these “corny” little desserts! Being from a family of Kansas corn farmers, our family grew up regularly shucking some delicious fresh corn-on-the-cob for dinner. All the better with butter. And salt (a non-negotiable at my grandma’s house). And of course, lots of dental floss afterwards. But I’m pretty positive that we never had it for dessert. And definitely not in the form of the oh-so-popular cake pops! So this is where the city-girl granddaughter comes in! For a fun twist on summer desserts, I decided to make some simple little cake pops in the shape of little corn on the cobs. Or corns on the cob. However you say it! 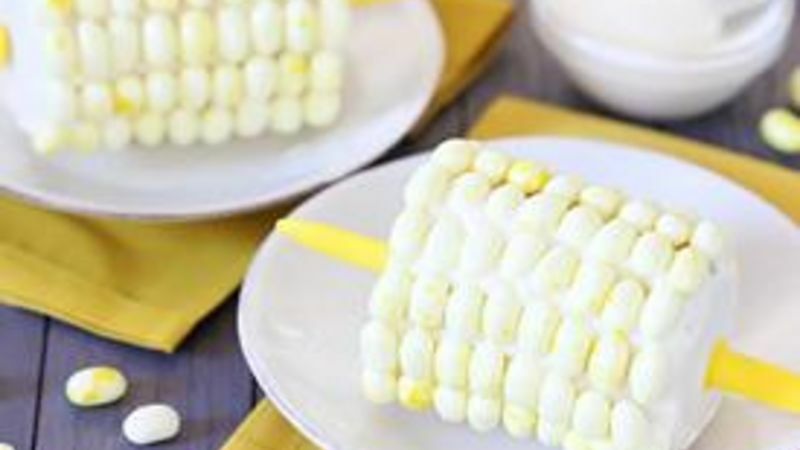 Either way, these cute little Corn-on-the-Cob Cake Pops are super fun to make. And even more fun serve as a surprise to your friends and family, and see their smiles at your “corny” little desserts. First, whip up a Betty Crocker yellow cake mix according to the package directions in a 9x13 baking dish. Then use your fingers (really – much better than a spoon or whisk) to crumble the cake into little pieces, and then use your fingers to evenly mix in the frosting. So easy. Then pop the crumbled mixture into the freezer for 10-15 minutes, and spray a well-rinsed aluminum can (or whatever you’re using as a mold) with cooking spray. Remove the chilled cake pops mixture, and then spoon it into the greased mold until it is packed in solid. Then squeeze the can a little bit to loosen the mold, pound on the bottom of the can a few times, and watch as the corn-on-the-cob base slides right out. Repeat 5-6 times, and then freeze the cake pops until the edges are chilled (at least 30 minutes). Once the cake pops are chilled, heat the white chocolate chips or almond bark carefully in the microwave or in a double-boiler until melted, stirring occasionally. Spoon some of the chocolate onto one of the ends of the “cob”, and then place the yellow holder in the end. Repeat on the other side. Lay the cob on its side, then spoon a small strip of chocolate along the length of the cob. Quickly press the jelly beans into the chocolate in a single-file row before the chocolate freezes. Repeat with more chocolate, jelly beans, chocolate, jelly beans, etc. until the cob is covered. Repeat with remaining cobs. Enjoy the “corny” fun!!! Ali loves music and fun food! Check out her great stuff at her blog site, Gimme Some Oven, and her Tablespoon profile -- and keep watching Quick Dish to see what colorful, nommy recipes she dreams up next!